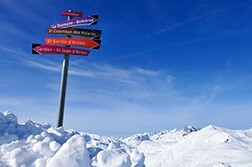 You will find in this topic, guides if you want to ski or enjoy a relaxing stay in the snow. Again, this year we have negotiated for you discounts on the ski lifts and ski equipment that will apply if you book at the same time as your accommodation. For each reservation, the sum of €20 is perceived as booking fees. 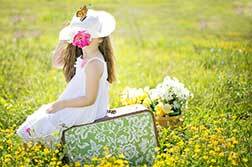 These fees are in addition to the accommodation rates shown in the catalogue or on our website and are not refundable. What a pleasure to swim in a heated pool to relax after sports days to descend the ski slopes, or for no-skiers. You will find an indoor pool in Combloux, Aussois, Saint-François Longchamp (Le village Gaulois et les 4 vallées), Saint-Sorlin d’Arves, les Coches, les Ménuires, Font-Romeu, la Mongie, Superdévoluy, la Joue du Loup, Super-Besse (Matins de Sancy). 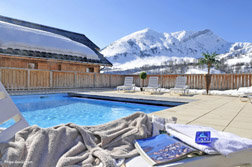 An outdoor pool at Saint Jean d’Arves (les Ecourts): what a pleasure to swim in water at 28 °, with the view of snowcapped! Even better: a swimming pool semi internal and semi external in Saint Colomban and Le Corbier. To fine tune your relaxation, most of our residences are equipped with a sauna! For example, the residences of Le Corbier, La Toussuire, Albiez, La Norma, Aussois, Saint-François Longchamp (Le Rond-Point des Pistes), Saint Jean d'Arves (Les Marmottes) are located at the foot of the slopes. Les Sybelles, 310 km of slopes, connection of the ski areas of La Toussuire - Le Corbier - Saint Sorlin d’Arves – Saint Jean d’Arves and Saint Colomban. Cottages single or paired, a certain idea of holidays in the snow! Saint-François Longchamp (Le Village Gaulois), La Toussuire, and Saint Jean d’Arves (Les Ecourts: chalets divided into 4 apartments). In Superdevoluy and La Joue du Loup in the Southern Alps. 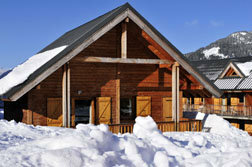 You will also find 'mind-chalet' in duplex in Saint-colomban (7-8 persons) accommodations, with wooden interiors. 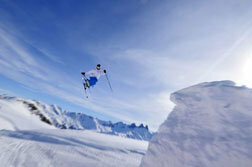 Large ski areas up to 600 km of slopes, resorts for ski fans! Montchavin – Les Coches, access to the area of la Plagne and Paradiski. Saint-François Longchamp, access to the Grand-Domaine Saint François-Valmorel (nice and technical tracks). Les Sybelles, 310 km of slopes, connection of the ski areas of La Toussuire - Le Corbier - Saint Sorlin d’Arves – Saint Jean d’Arves and Saint Colomban. 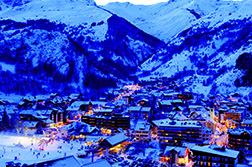 Aussois, Albiez, Saint Jean d’Arves, Valloire, La Joue du Loup, are village ski resorts, to the traditional décor. We recommend stations particularly suitable for hiking, accessible for all levels, with superb scenery. 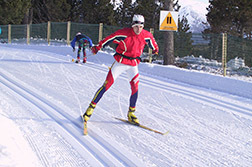 In Haute-Savoie; Combloux, with Mont Blanc as "wallpaper"
In the Pyrenees; Font-Romeu, 110 km of slopes for cross-country skiing, the extraordinary scenery (plateaus and Lakes), sunny. 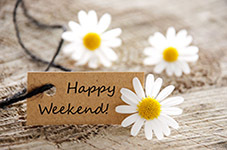 We particularly recommend Saint Jean d’Arves (les Marmottes), Aussois, la Norma, Le Corbier, Albiez, Saint-François Longchamp (Les 4 Vallées), les Coches, les Menuires. 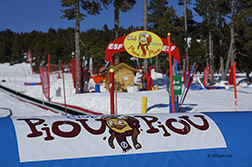 For young children and day care of snow, you can focus on Aussois, la Norma, Saint Jean d’Arves (les Marmottes), as well as le Corbier and Saint-François Longchamp (les 4 Vallées).